This is a collection of pictures illustrating the fashions of the sixties for both men and women. These pictures show how ordinary people looked in the 60s. This girl (left) is dressed up to go out in 1963. The look is smart and formal. Her shoes have pointed toes following the winklepicker fashion. 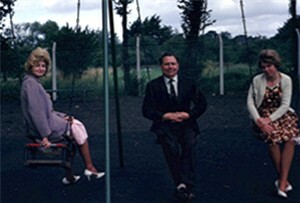 This group, on the swings, is older. This picture is also from 1963. The two ladies have colourful dresses and both are wearing white shoes. The man is wearing a suit. This is 1966. These are two young, married couples. The look is very smart. The men have suits with slim lapels and narrow ties. One has a narrow tie clip. One of the girls looks to have velvet trousers and a velvet top, the other is wearing a dress. Both the men are smoking. Although the health risks from smoking were known by 1966, few people fully understood them and fewer still took them seriously. 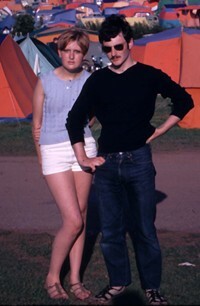 This photograph, right, shows a young couple at a campsite in 1967. They are wearing casual clothes, shorts and a top for the girl and the man is wearing jeans and a pullover. Both have short haircuts, so they are clearly not members of the Flower Power generation. The girl has sandals and the man is wearing trainers. 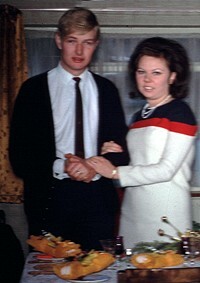 Left, a young married couple in 1969. They look to be in their twenties. The young lady has a bouffant hairdo, which was conservative for the late sixties. Her dress is more stylish with a simple stripe pattern. She is wearing pearls and a small ladies' watch. The young man is also conservative, he is wearing a white shirt with cufflinks and a narrow tie. The cardigan was very popular with men in the 60s and early 70s. For a party at home, a cardigan with a tie was acceptable. However, it was still common for men to wear suits when visiting friends' homes for dinner parties. The man's short haircut is in a fashionable style for the late sixties. Teenagers by now were growing their hair long, but married men in their twenties would not have participated in the Flower Power revolution. 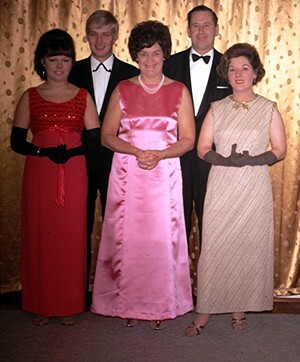 Black tie was worn by the middle classes in the sixties to formal parties. 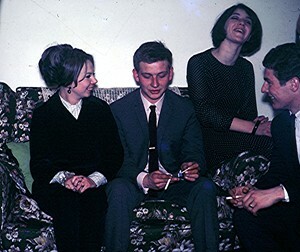 This group (right) is from 1969. In the 60s, bow ties were almost always black. The men's jackets have narrow, shawl collars. Dinner jackets followed a similar line to the suits of the era. Bow ties tended to be narrow. 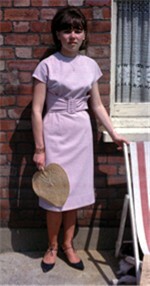 The ladies long dresses are typical of the late sixties. Dressing up for the evening was part of the dream of a glamorous sixties' lifestyle portrayed in the adverts of the era. Advertisements for cars often featured men in dinner jackets and ladies in glamorous evening dresses.